The Boring CompanyElon Musk said broken parts from flying cars could hit people on the ground. During an event for his tunnel-digging company, The Boring Company, on Thursday, Elon Musk explained why flying cars could be more trouble than they’re worth. His biggest concerns are noise and the potential for a broken part to fall and hit someone on the ground. “Inevitably, somebody’s not going to service their car properly and they’re going to drop a hubcap and it’s going to guillotine somebody,” Musk said. While he’s founded companies that are trying to define the future of transportation with electric vehicles, space exploration, and tunnels that would house high-speed transit systems, Elon Musk doesn’t like flying cars. 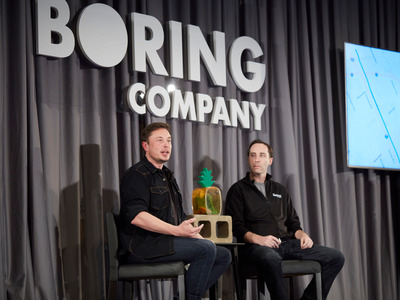 During an event for his tunnel-digging company, The Boring Company, on Thursday, Musk explained why flying cars could be more trouble than they’re worth. Musk said his biggest concerns are noise and the potential for a broken part to fall and hit someone on the ground. Musk has expressed similar concerns before, and believes it’s better to address traffic congestion by building high-speed, underground transit systems like Loop and Hyperloop. On Thursday, Musk outlined how the Loop system might work. Loop is a lower-speed alternative to Hyperloop, which was first proposed by Musk in a 2013 white paper. Hyperloop would be used for travel between cities, while Loop would carry passengers over shorter distances. Each would send passengers in pods through underground tunnel networks, but while Hyperloop pods would surpass 600 mph, Loop pods would travel at 150 mph due to differences in how the tunnels are pressurised. Some of Musk’s competitors are developing aircraft that resemble flying cars. In early May, Uber unveiled a flying taxi prototype for its upcoming Uber Air service, which will transport passengers between rooftop landing pads the company refers to as “skyports.” Uber intends to test the service in 2020 in Dallas and Los Angeles and begin offering commercial rides in those cities in 2023.